Being one of the most historic capitals in the world, Delhi has many tourist sites. 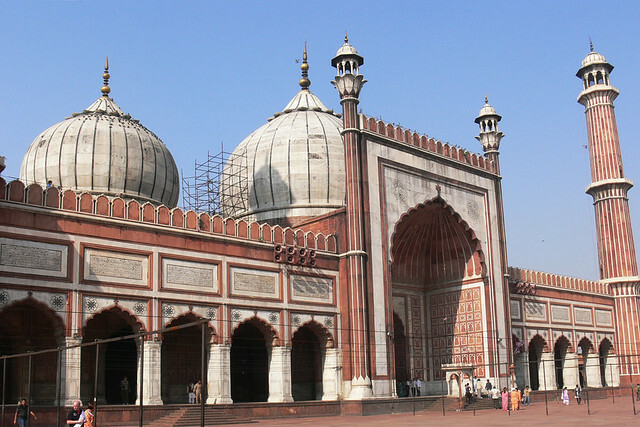 In Old Delhi, there are attractions like mosques and monuments that represent India's history. The important places in Old Delhi include the majestic Red Fort. 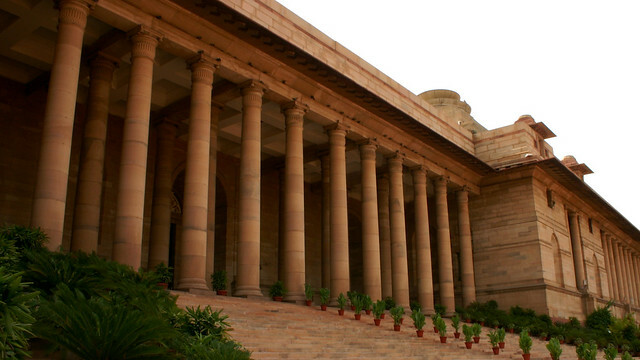 New Delhi, on the other hand, is a modern city designed by Edwin Lutyens and Herbert Baker. New Delhi houses many government buildings and embassies, apart from places of historical interest. here we list out the top tourist attractions in Delhifor you . Delhi, Capital of India has many attractions like mosques, forts and other monuments that represent India's history. The important places in Old Delhi include the majestic Red Fort. New Delhi on the other hand houses many government buildings and embassies, apart from places of historical interest.The Qutub Minar, Red Fort and Humayun's Tomb have been declared World Heritage Sites. 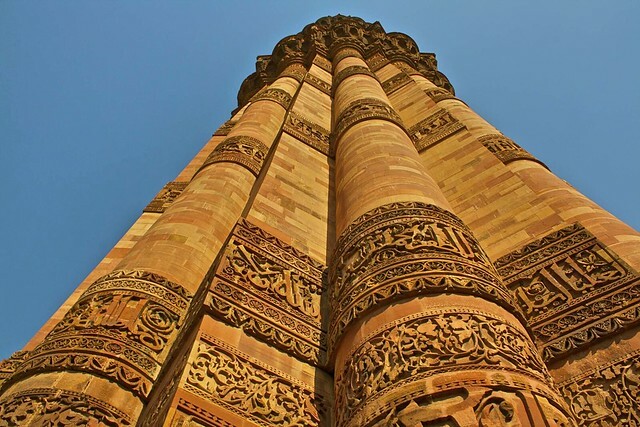 Qutb Minar is one of the famous monuments of the world and the tallest brick structure of the world. History reveals that this monument was built ruining the ancient Hindu temples centuries back. 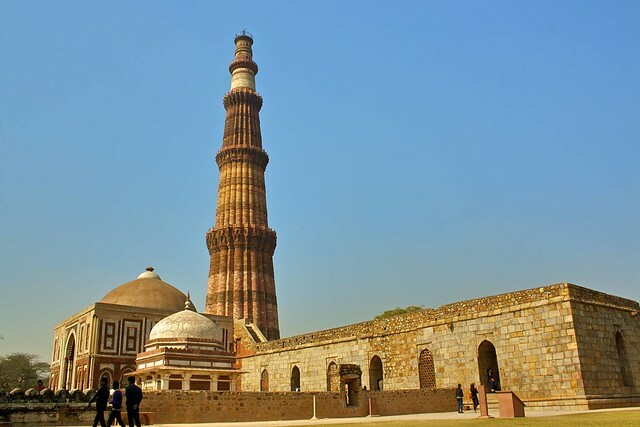 There are other ancient monuments that stand surrounding Qutb Minar, and are collectively known as Qutb complex. The monument is also spelled as Qutub Minar.South Delhi houses the Qutb Minar one of the perfect examples of Indo-Islamic architecture. This is the highest tower of India, measuring a diameter of 14.32m at the base with the crown of the structure measuring 2.75m in diameter. The 72.5m tall tower has reportedly hit by lightening twice since it was built. Masjid-i Jahān-Numā commonly known as the Jumma Masjid is the last architecture that was built during the Mughal emperor Shahjahan. It stands in the busy street of chandni chowk of Old Delhi just opposite to the Red fort. This Masjid is named after the weekly Friday worship of Muslims known as Jummah.The construction of the Masjid started during the reign of the fifth Mughal emperor Shahjahan. The construction took six long years for its completion and was splendor of structures of those years. It is India’s largest mosques and the courtyard itself holds around 10000 people at a time. Delhi has several historical monuments. Ashoka Pillar is one of these monuments that mark the ancient structure and the love for structures the then king Ashoka had. Ashoka not only had love for buildings but he also was fond of collecting antiques. This astonishing Ashoka Pillar is a gift by the third Sultan ruler of the Tughlaq dynasty. This pyramidal structure was gifted by Feroz Shah to Delhi and was transported from Topra during the mid second century BC. One Ashoka Pillar is located near the Delhi Gate and the other near Hindu Rao Hospital. On the order of Firoz Shah the first one was transported from Topra to Delhi and the second one was transported was from Meerut and was put up near Hindu Rao hospital. Both the Pillars were taken much care during the transportation. Red fort is the most famous and largest monument in the old Delhi. It represents the royal evidence and crowned glory for the Mughal palace fort building. It is a symbol of political and economical power. It has withstood several rumors of time and nature for centuries. It is also known as Lal Quila. The Red fort is referred as the most haunting spot for tourists both from India and abroad. It is located in the northeast corner of the Shahjahanabad in old Delhi and situated on the western bank of River yamuna. This fort was built by Emperor Shahjahan. It almost took nine years to complete this building (1639-1648). It was constructed only with the huge collection of red sand stones, which surrounds the whole building. Lotus temple or Bahai temple is located in kalkaji in the south of Delhi. It is spectacular place of worship in the city. It is an ideal place for meditation, in order to acquire peace and tranquility. The marvelous architecture is made up of marble, cement, dolomite and sand.Lotus temple is a masterpiece of ancient concept wrapped with modern creative skills and architectural skills. It is a rare design and known for unexceptional in aesthetic value compared to the other architects in the world wide. The architect designed the temple with an Indian symbol which stands for heavenly beauty with the simple illusive idea compiled with intricate “geometry” and finishing in the concrete form. Earlier the Rashtrapati Bhavan was known as Viceroy’s House and after Independence it’s being occupied by Governor General of India and so it is now known as President’s house. It is a royal existence in the history of democracy for being the residence of the president of the largest democracy in the world.This building was designed by the British architect Sir Edwin Lutyens and it is perfect model for Indian architecture. It has the style of Mughal and European architecture. Its building and surrounding were called as “an Empire in stone”. It was build after the India’s capital changed from Calcutta to Delhi, which was popularly known as Delhi Durbar in the year 1911. 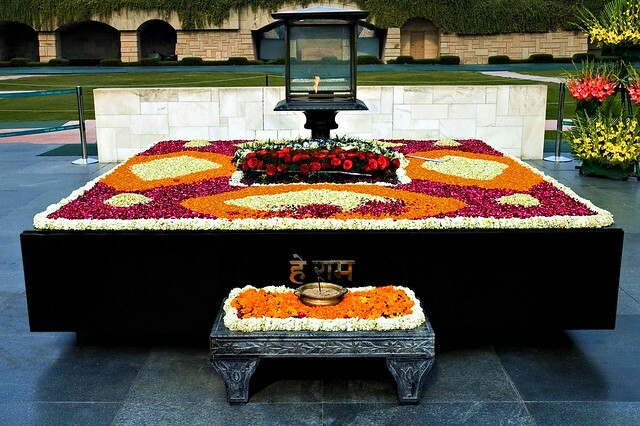 Raj Ghat, a memorial to Father of the nation - Mahatma Gandhi, is a simple black marble platform that marks the spot of his cremation on 31 January 1948. It is left open to the sky while an eternal flame burns perpetually at one end. It is located on the banks of the river Yamuna in Delhi, India. 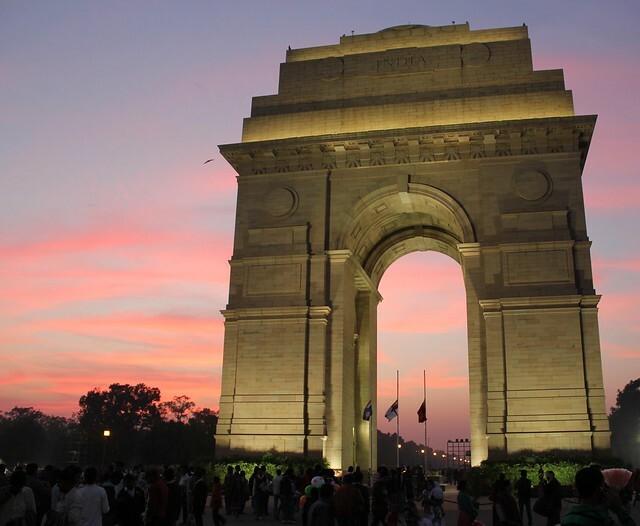 India Gate previously known as the All India War Memorial was designed by Sir Edwin Lutyens and was built in 1931. Lutyens was the chief architect who designed the plan for building Delhi as a city. India Gate is located in the eastern end of Rajpath at Rajeev Chowk which is hardly a kilometer far from the Connaught Place. This is one memorial which is open on all days, round the clock; however the ideal time to visit the memorial would be between 7.00 pm-9.30 pm.